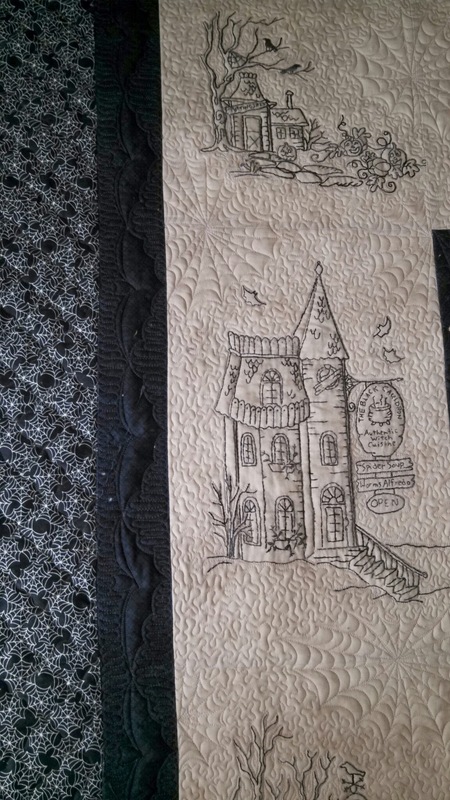 Halloween Embroidery Quilt – bats, cobwebs! 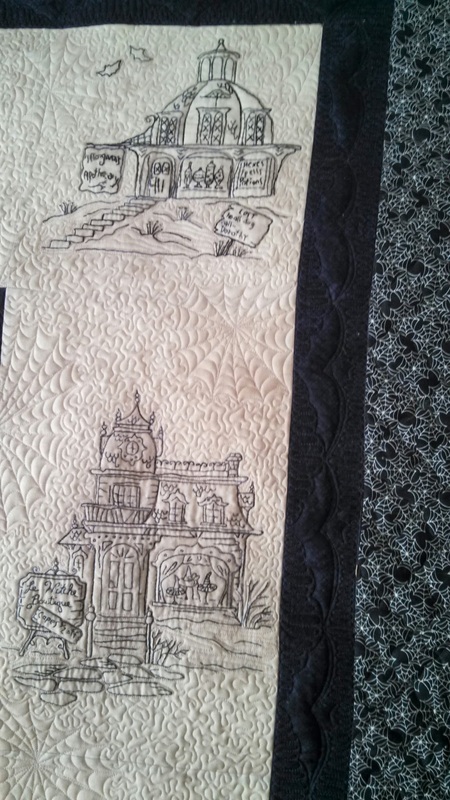 Here is a fun Halloween embroidery quilt. This one comes with its own story, too. 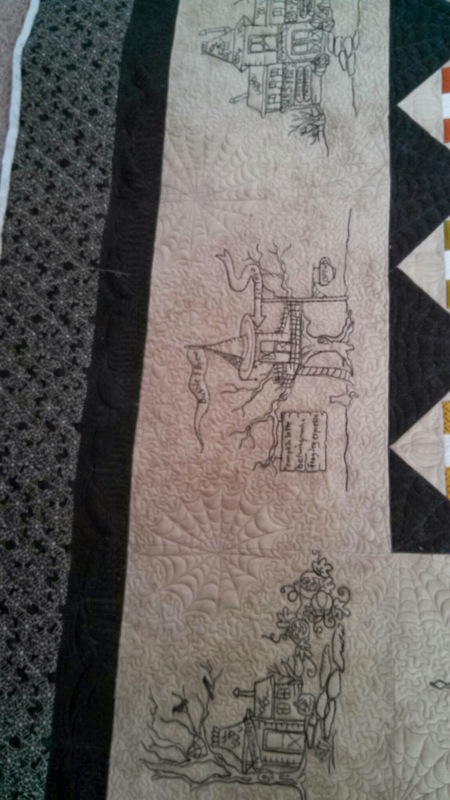 This was embroidered by the husband of one of my quilting ladies (Fred and Kathy). 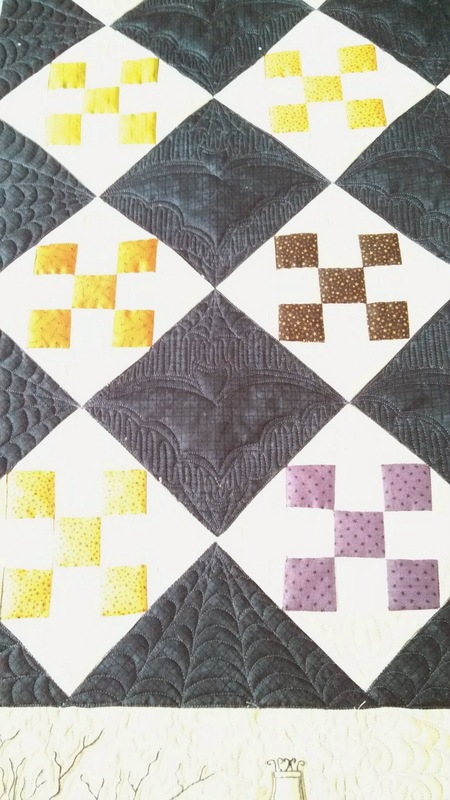 He embroidered the blocks and she put the pieces together in a quilt. 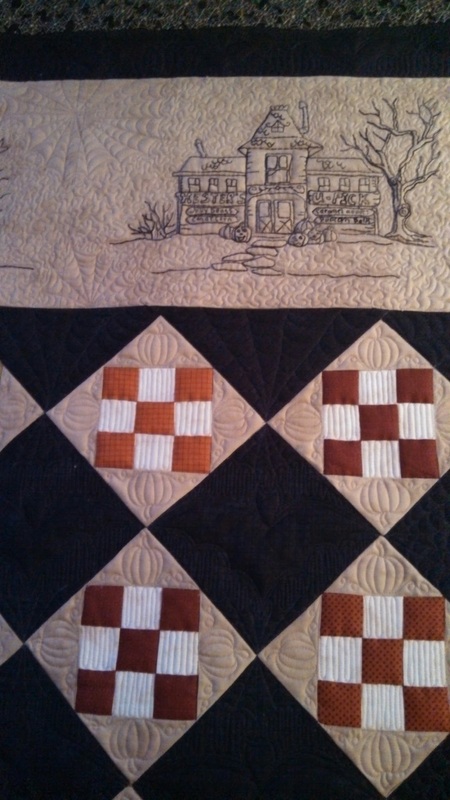 When they brought the quilt over, I talked to him a lot about how he got into embroidery, etc. It turns out he used to create stained glass. 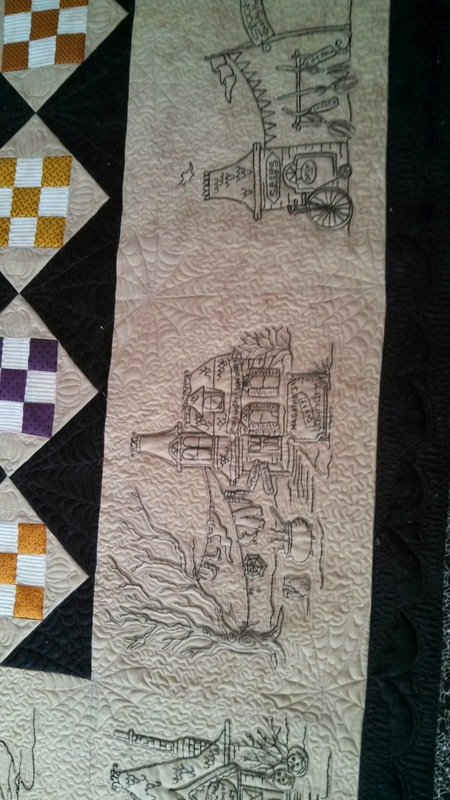 He burned out on it after several years and had turned to embroidery as a creative outlet. I found his story extremely interesting — I was and am fascinated with glass art of all kind. 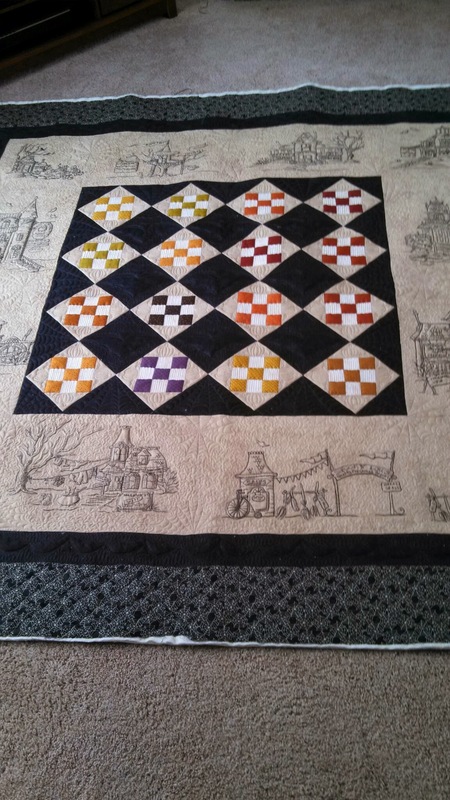 They offered to show me the pieces they still had at their house and we arranged that I would deliver the finished quilt and get to see these pieces in person. 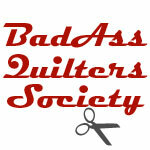 My friend Cathy and I delivered the quilt last Saturday (8 inches of snow didn’t stop me either). I am SO glad I did. They have a gorgeous country home and it was one of the nicest visits I have had. He had several windows with the bottom halves replaced with stained glass pieces, as well as several large sun catchers throughout the house. Everywhere I turned there was some creative piece I drooled over. At the end of the tour, Kathy opened a drawer that was filled with a variety of Christmas sun catchers and then SURPRISE! They gave me and my girlfriend two each – a candy cane and a Snowman. I was THRILLED! They are now hanging in my kitchen window and I love them. I’ll be retelling this story each time someone asks about them at Christmas from now on. Isn’t that the coolest thing ever?! 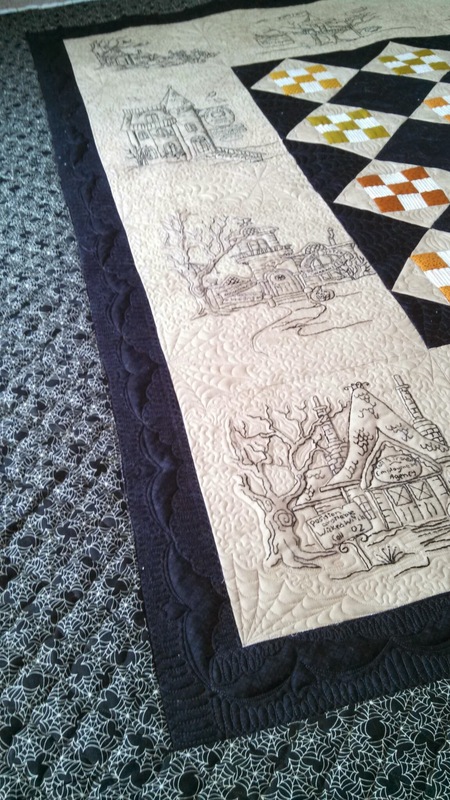 I also came home with a gorgeous Thanksgiving embroidery quilt and he is working now on a Winter one that I cannot wait to see how he finishes it. 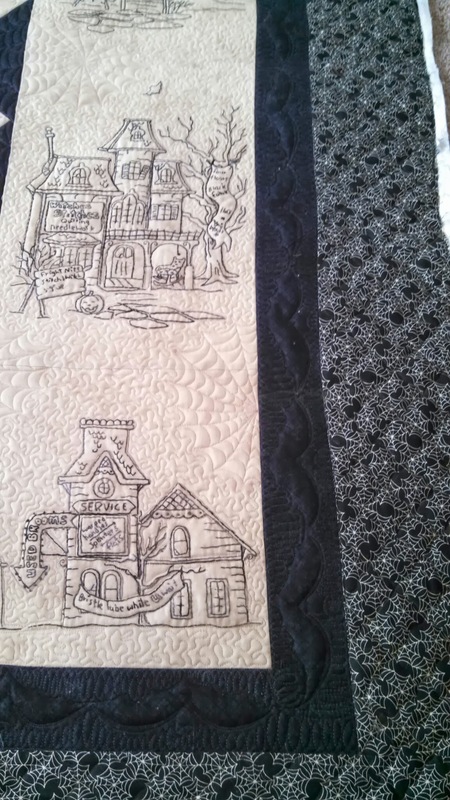 For this Halloween quilt, I came up with a bat motif that I could stitch in one pass in the borders and the black blocks and did a shaky crosshatch in the outer border and stippling around the embroidery. The middle 9 patches got a pumpkin design also. I loved how this turned out and so did he. Two battings – 80/20 on bottom and cotton on top. So Fine and Bottom Line threads.